By Dan Ambrose: Former WBC middleweight champion Julio Cesar Chavez Jr. will be returning to the ring on June 22 against possibly unbeaten light heavyweight contender Mike Lee (21-0, 11 KOs) in Mexico. Chavez Jr. (50-3-1, 32 KOs) wants to fight three times in 2019 before going after one of the world champions at super middleweight. It’s been almost two years since Chavez Jr. last fought in losing a wide 12 round unanimous decision to Saul Canelo Alvarez in a catch-weight fight at 164 1/2 pounds on HBO pay-per-view on May 6, 2017. Chavez Jr. wasn’t competitive in the least in losing by the lopsided scores 120-108, 120-108 and 120-108. Although it was a good idea on paper for Chavez Jr. to fight Canelo, it didn’t work out well due to the amount of weight Chavez Jr. had to take off during training camp to get down to the 164.5 lb catch-weight weigh-in limit for the fight. Chavez Jr. started camp at 235 lbs, and it was too much weight for him to lose rapidly without sacrificing muscle. On the night of the fight, Chavez Jr. looked weak and painfully thin. As weak as Chavez Jr. looked, it’s not surprising that he threw almost no punches n the fight. “I’m going to fight on June 22, I think in Mexico,” Chavez Jr. said to ESPN Deportes. “It seems he’s going to be an American, Mike Lee…undefeated, a good opponent, and good fighter, who was once talked about to fight Andre Ward,” Chavez Jr. said. The light heavyweight Lee, 31, has been facing no name opposition since he turned pro nine years ago in 2010. For some reason, Lee hasn’t ever stepped it up against world class opposition, and he’s now going on his 10th year in the pro ranks. Chavez Jr. would be a good fight for Lee to see if he’s got the talent to mix it with a former WBC middleweight champion. Chavez Jr. hasn’t done a lot with his career since losing to Sergio Martinez by a one-sided 12 round unanimous decision in September 2012. For all intents and purposes, the loss to Martinez was the beginning of the end for Chavez Jr. as a top level fighter in boxing. Since that fight, Chavez Jr. has lost to Andrzej Fonfara and Canelo Alvarez. The fighters that Chavez Jr. did beat, Brian Vera x 2], Marcos Reyes and Dominik Britsch, were lesser guys that weren’t world level. What’s disappointing is Chavez Jr. has fought only six times in the last seven years. That kind of inactivity is hard to understand for a former world champion. Once Chavez Jr. started making the good money in fights against Martinez and Canelo Alvarez, he stopped fighting as often, and his career has gone downhill. “Obviously I will not fight a big or championship fight,” Chavez Jr. said. “I just came back, but I’m training well, doing hard work in the gym. The inactivity is the least, because I’m still young and I’m not beaten,” Chavez Jr. said. Chavez Jr. is 33-years-old, but whether you can still call him young or not is debatable. The way that Chavez Jr. has taken punishment throughout his career, he’s arguably got a lot of ring wear on him. Besides the ring wear and the soft living that Chavez Jr. has had, he doesn’t have an advantage over fighters at super middleweight or light heavyweight that he had when he was fighting at middleweight. When Chavez Jr. was still capable of melting down to 160, he would balloon up after rehydrating and use his size advantage to beat smaller guys than himself. Once Chavez Jr. could no longer fight at middleweight, he’s not looked impressive. There are a lot of talented fighters at super middleweight that Chavez Jr. would have problems with. It would be a bad idea for Chavez Jr. to fight someone like David Benavidez. Chavez Jr. isn’t going to get a rematch with Canelo Alvarez at 168. The way that Chavez Jr. failed to perform against Canelo in 2017, Golden Boy Promotions will likely never take the risk of putting those two fighters back in the ring with each other. 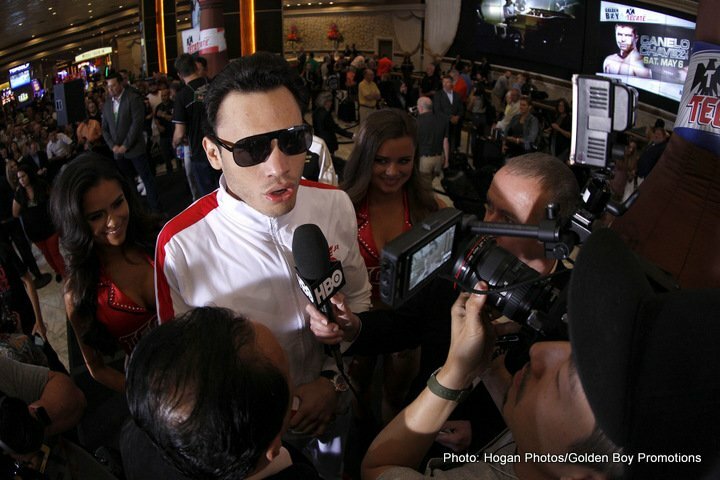 More boxing news on: Chavez Jr. vs. Lee, Mike Lee ,Julio Cesar Chavez Jr.